In light of the Big Unit's chase for his 300th win, Joe Posnaski had a recent co-column for Sports Illustrated with Bill James and has just blogged his own piece on the nature (and unpredictability of) 300-game winners. Both are great stuff, full of well-written insights and clever commentary that most of us only dream of being able to produce. His point, in both cases, can be summed up in the one word that Joaquin Andujar gave us: Youneverknow. More specifically, Joe says the one thing you can't know is whether a guy will win 300 games based on what he does in his 20's, and I have to agree with him there. We've seen too many guys who were just awesome in their 20's (Bert Blyleven, Jim Palmer, Robin Roberts) who didn't quite made it to 300, and others (Doc Gooden, Sandy Koufax, Dizzy Dean, Don Drysdale) who never got close. So, it’s really impossible to predict. Randy Johnson only had 99 victories at age 31. Phil Niekro only had 97 victories at age 33. Gaylord Perry, Warren Spahn, Nolan Ryan, Early Wynn … these guys did not look like great bets for 300 when they reached their mid-30s. But they won a lot of games late in their careers. 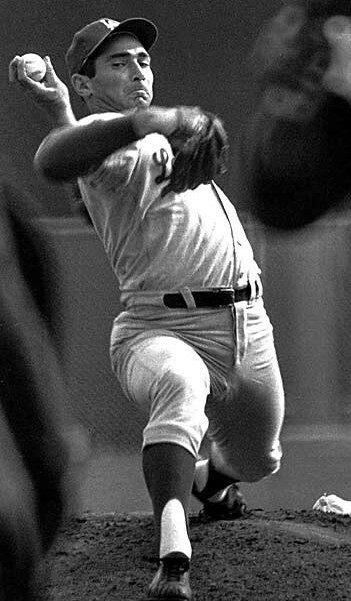 Niekro, as a knuckleballer, just kept going and going and going. Perry had a late career renaissance — he won 21 games as a 39-year-old and 47 more after that. Warren Spahn won 20-games or more seven times after he turned 35. Randy Johnson was probably at his very best from age 35 to 40. And so on. He's got a point, but I disagree that Ryan and Perry and Spahn and Wynn weren't good bets to make it to 300 by their mid 30's though. Each of them had about 200 wins by the end of their age 35 seasons, and all were above average workhorses, if not spectacular. That turns out to be a pretty good bet, actually. If you look at the 17 pitchers (including Randy) who've won 300+ games since 1900, 14 of them (82%) had about 200 wins (Perry had 198) and an ERA+ of 110 or better by the end of their age 35 seasons. The other three are Johnson and Niekro, two guys who had to take half a career to learn how to pitch, and the ironically named Early Wynn, who got his 300th and final Win in July of his age 43 season. Johnson had so much potential, so he was always going to get his chances. Lefties who throw 100 mph don't grow on trees, you know. But he also had so many control problems that he didn't have his first decent season until 1990, when he was already 26. Niekro, a knuckleballer, did not make it to the majors until he was 25, and did not have a productive season until he was 28, again because of control problems, although obviously for different reasons. Wynn was basically a better than average innings eater who lucked into playing for the Indians in the 50's and later the White Sox, both during their peaks. Good teams will get a lot of wins for a pitcher who provides a lot of innings. These three are the exceptions, though, not the rules. You can certainly look at Wynn and Randy and Niekro and say "Youneverknow", and that's true, but it doesn't give us any kind of hint at what we might know, down the line. For that, you have to look at correlations. What do the guys who win 300 games have in common, earlier in their careers, and how likely are they to go on to win 300 games? As I mentioned, excluding the guys who thrived in the late 1800's, there are 17 pitchers who have won or will win 300+ games. As of their mid 30's, i.e. after their age 35 season, 14 of these had at least 195 Wins and an adjusted ERA at least 10% better than the league. Eighty-two percent is a pretty high correlation, though it should be noted that 41 pitchers meet those requirements, and only 14 of those have made the 300 mark. Still, 14 out of 41 is 34%, better than one in three odds. At the moment, Andy Pettitte is the only pitcher in baseball who meets these criteria, and giving him one in three odds to win 300 games sounds just about right to me. That may be a little too generous, given that he probably can't survive long if he loses any more off his fastball. Andy had 201 Wins and a 118 ERA+ after that age-35 season, i.e. 2007, and currently has 219 Wins and an ERA+ of 116, though the trend is of course not in his favor there. But it's not out of the question for him to keep posting approximately 200-inning seasons with a roughly league average ERA, winning about 15 games per year, since the Yankees will always have good hitters. The next step down would be Roys Halladay and Oswalt, plus Mark Buehrle, each of whom had or has at least 125 Wins and an ERA+ of 120 or better through (or in) their age 31 seasons. The Chicago White Sox Schedule is filled with themlikes of the Royals and Tigers, so Buehrle especially should get his shot at racking up the necessary wins. Tim Hudson also met those criteria, but his injury will hamper his chances severely. Johan Santana, only 30 and with 114 Wins already, will likely join them by the end of 2009, as will C.C. Sabathia, who needs only 4 wins to reach 125 and is only 28. Eight of the 17 pitchers to win 300 games since 1900 met those criteria at one point, though so did 29 other pitchers who never got to 300. Eight in 40 is 5-to-1 odds, so there's a decent chance that one of the six (C.C., Buehrle, Hudson, Santana and the two Roys) will eventually make the 300 mark. None of them has better than a 20% chance, but as a group there's a good chance that one of them is the next 300-game winner. We just don't know which one, yet. Good stuff, Travis. This whole "last 300-game winner"-thing is just nonsense, and what you did here shows that pretty well. There is actually a good crop of potential 300-game winners playing right now (though my money would be on the 31-year olds, not Pettite... I'm not sure he's healthy enough to keep going). Thanks in advance. I have you linked.